This is a continuation of our series on Busting Password Managers. Check out the first post here. In this post, instead of focusing on technical controls that attempt to prevent browsers from remembering sensitive passwords, we are going to focus on detecting the presence of a password manager. To test this hypothesis, we again started with the default Visual Studio 2013 MVC C# project. The source code is available at https://github.com/pvwowkfn/AutoCompleteBlog/tree/DetectPassManager. When the page is loaded by the browser, our "submit()" function intercepts the regular form submit and checks the wrotepass flag. 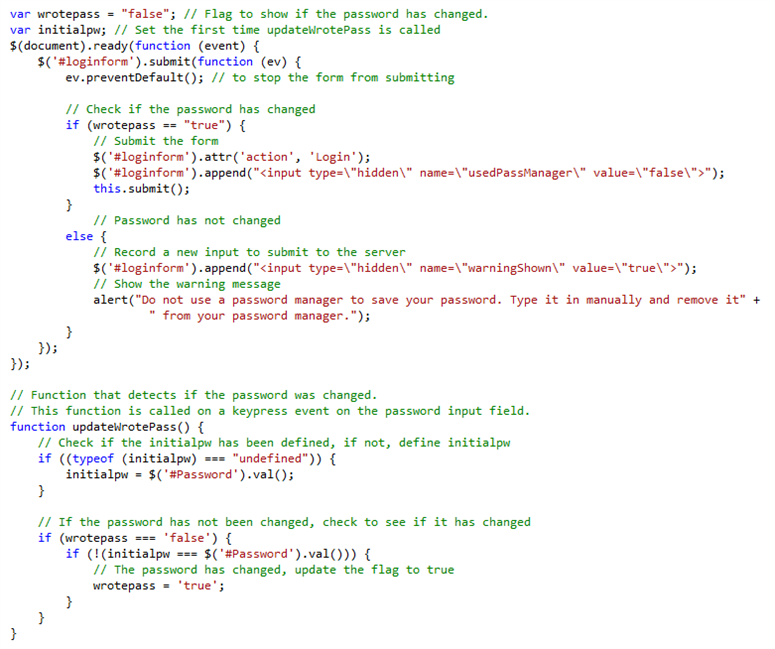 If wrotepass is set to true, then the function sets the correct form action, adds a flag (usedPassManager=false) indicating that the user wrote the password, and then submits the page to the server. However, if wrotepass is false, a warning alert is shown, and a hidden flag (warningShown=true) is added to the form to be sent to the server. Ultimately, this is a detective approach to solving this problem. Previous approaches were corrective in nature. Using this detection mechanism, it is possible for the developer to do a number of things besides showing a simple alert box, e.g. force the user to reset their password or maybe use two-factor authentication. If the goal is simply to detect the presence of a password manager, then the detection script could be packed or obfuscated, and the additional hidden form value could have its intent obscured by changing its name.